It’s payback time for New York’s senior senator, and the Second Ave. Subway stands to benefit from Chuck Schumer’s handling of the DSCC in 2006. Once upon a time, on the very first day of Second Ave. Sagas, I wrote about how Schumer’s success during the mid-term elections would lead to subway pork for New York City. Now, the money’s coming home. On Friday, the United States Senate passed their appropriations bills for the upcoming fiscal year 2008. In that bill coming our way is $125 million earmarked for the Second Ave. Subway. Before we can start counting our money, the bill still has to go through the conference committee session. It’s really just a formality at this point. Also in the Transportation Appropriations Bill is $200 million for the East Side Access Project. It sure is good to have politicians who can deliver the pork. The two Senators — Schumer and one Hillary Clinton — issued their typical responses praising the projects. Schumer spoke about the necessity of the projects. Clinton extolled federal investment in these projects. 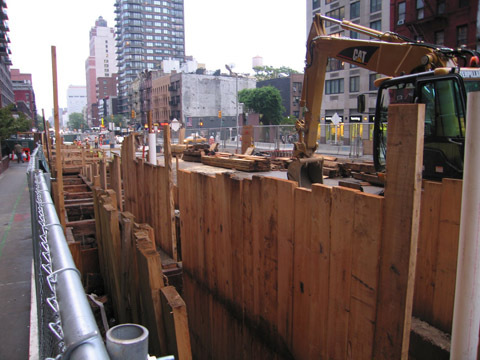 “Now that the ground has been broken and the commitment is real for the Second Ave. subway, this kind of federal investment is critical to helping the city and state keep the project on track,” she said. While this federal infusion still leaves the MTA a few hundred million dollars short, the federal funds should cover the gap should congestion pricing become a reality. Phase 1 of that Second Ave. Subway is getting closer and closer to reality. Who woulda thunk it?